This beautiful pendant lamp by Sarah Turner is made out of 30 Coke bottles. My friend Joel was kind enough to send me a link today to the work of iri5 on flickr. Yesterday I took an awesome silk screening workshop run by the Spins & Needles people. 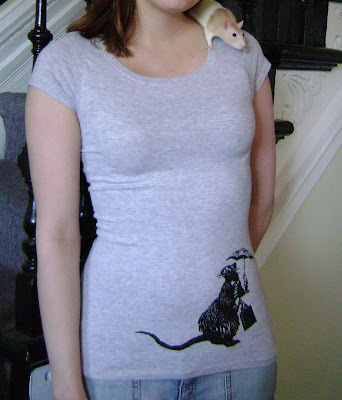 I had a blast and am now itching to try it again at home.Is there really such a thing as too many Banksy rat t-shirts? Nim & Noi would never be caught in a photo like this. 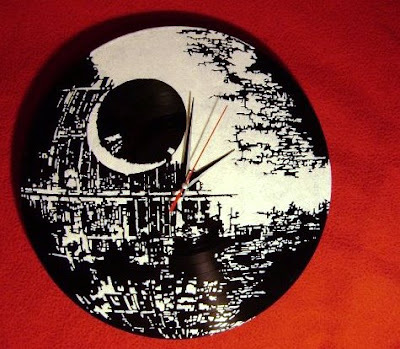 How awesome is this clock?!? I’m very proud of this piece. 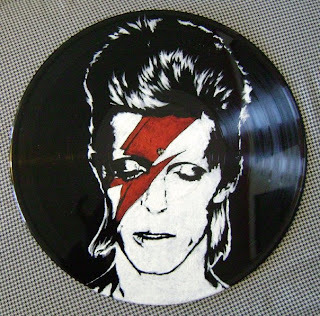 The stencil took me forever to make, but it was well worth it. I’ve already sold two, and I will be making more as soon as I get my hands on some more clock parts (there’s a pun in there somewhere...). I don’t know what came over me yesterday, but I couldn’t stop myself. I bought a pair of these. I do not own, nor do I have any intention of ever owning, a cat. Simone, Chris’ unbelievably obese kitty, might be in for a treat. At least I didn’t drop $30 US on these. Three De'cat'pitated Heads by SpellwellBecause I kind of wanted to. A little fun with colour.